I bought the iStick 100 TC from Heaven Gifts while it was on sale. I also had a coupon That brought the price down to $22.10 shipped. I bought the OBS Crius (several times, but more on that later) off of eBay. As such, I'm just going to speak my mind. As always, these are just my opinions... I'm just this guy, y'know... Your mileage may vary. By now, most everyone knows that Eleaf, Joyetech, and Wismec are the same company. It stands to reason, then, that if the TC works as advertised on the Cuboid, it'll work on the iStick 100 TC. This is true, but there are enough differences to warrant a closer look. The device is a dual 18650 box mod that measures 52 mm x 93 mm x 23 mm. The batteries are installed on either side of the device and the doors are secured with magnets. The doors can be swapped with other iStick 100 TC mods to create a unique look (black doors on a white device, etc. ), and the doors can be put on either side. The doors can be purchased separately. They cannot be installed upside down. Down the front center of the device is a black strip. This makes the device look very much like an oversize, replaceable battery iStick 50 - right down to the nicely rounded sides. In that strip, at the top, is a pretty standard iStick OLED screen that displays the voltage, wattage, temperature, resistance, mode, and battery strength. Different items are displayed depending on what mode is in use. It will not, of course, display temperature in power (wattage) mode. Beneath the screen are the up and down buttons and a mode button. On the other side of the device is a wee bit of branding on top and bottom: Eleaf, and iStick TC100W. There is also a bit of venting at the top. On the bottom of the device, there are a couple certification/warning stamps, a microUSB port, and additional venting. There is no battery specific venting to be found as the battery doors do not seal. On top of the mod is the stainless steel threaded 510 connector with a spring loaded center pin. Like a lot of other Eleaf/Joyetech/Wismec mods, the 510 is not the deepest and some atomizers will leave gaps when attached. If the atomizer is tightened down to remove the gap, it can damage the 510. 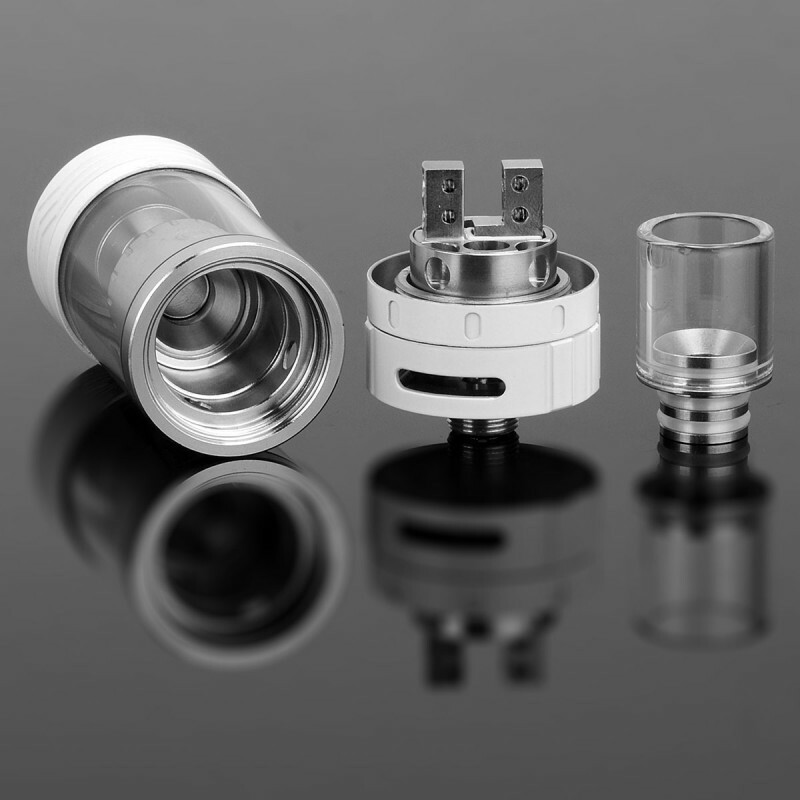 It is best to learn to live with the gap or find an atomizer that fits properly. On top is also a physical lock switch. Something not seen on box mods very often, and quite welcome. It will fire down from 0.05 to 1.5 Ohms in TC modes, and from 0.1 to 3.5 Ohms in Variable Wattage or Bypass mode. The wattage will run from 5 to 100 (120 with the firmware upgrade), and the accelerator is pretty quick once it kicks in. That description still sounds pretty standard. Nothing, beyond the physical switch, stands out yet. The device really starts to shine, though, when a battery is installed. A battery, as in one. The batteries are run in parallel and it is set up so that installing one battery will allow the device to operate at up to 75 watts. That's right! A dual battery mod that can run on one battery in an emergency. Emergency? Yup. I would not recommend running it that way all the time. In fact, as with all dual battery mods, purchase two of the same batteries from the same location at the same time, and always run and charge them together. Marry them to each other and to the device. While thinking about batteries and charging, it should be noted that charging batteries in this device is safe enough, but charging them in an external charger will be more efficient. The other item I really appreciate is the mode switch. This allows the user to select between the several modes (bypass, variable wattage, Ni for Ni200, Ti for Titanium #1, SS for stainless steel 316L, and M1, M2, M3 for different TCR values). Instead of delving into an arcane, confusing menu (I'm looking at you SMOK), the mode button is pressed and held a second or two, and the next mode is selected. The modes round robin. The final item that makes this device noteworthy is the fire button. Or rather, the lack of a fire button. The button is hidden under the battery cover on the side of the mod under the physical locking switch. When the switch is in the unlocked position, squeezing the battery cover fires the device. When the locking switch is in the locked position, the battery door does not squeeze in as much and the device will not fire. The fact that this device has firmware upgradeability would also be notable, but a lot of mods are now shipping with that feature. It has become commonplace. However, this one has already received an upgrade and will now operate at 120 watts. Unlike the iStick TC40W and many other TC mods on the market, but common to the iStick TC60W, the wattage applied in TC mod can be changed by pressing the mode button and the up or down button simultaneously. I spent some time with this feature being confused. I pressed mode and up and the device would display the wattage, but nothing would change. I spent about 10 minutes wondering why when I realized that the wattage was already maxed. The device does not round robin the wattage settings in any mode. The device is available in grey, black, and white. The white is kind of a pearlescent white I quite like. This is the only white iStick I own, so I cannot compare it to others. I also do not own a black or grey iStick TC100W, but the iStick Basic and iStick TC40W I own are grey and it looks like most any other anodized gray I've come across. Likewise, I own an original iStick and an iStick TC60W in black. It looks like most other anodized blacks. The finish does appear to be solid however, and I have seen no chips or scratches appear. It is a bit slippery, though. I would recommend being mindful of the grip, or purchasing a grippier silicon sleeve, or a skin. I've found it for as low as $27 and as much as $70. Some companies are bundling the device together with batteries and chargers and a tank which can save a buck or two if the additional equipment is needed. I've found the doors running around $8. Since I bought mine from Heaven Gifts, I'll link to them. Bypass - in this mode, nothing can be adjusted. The device will behave like an unregulated box mod. Pressing the up button increases the wattage - maximum is 100 (120 with firmware update) watts. There is no round robin. Pressing mode and up or down will increase the applied wattage in TC mode. This setting is saved across the various modes. That means that if wattage is set to 60 in SS mode, it will be set to 60 in Ni mode. In all modes, pressing the down and fire button activates or deactivates stealth mode. While off, pressing and holding (a long time) the up and fire button will bring up the adjustment menu for the M1-3 TCR settings. Clicking fire saves the setting and returns the device to selection mode. While off, pressing the down and fire button displays the battery voltage. Battery, not batteries, because they are run in parallel and behave like one battery. Upgrading the device's firmware is also quite easy. Download the software from Eleaf's site, extract it, connect the mod using a data capable USB cable, run the program. A small box will tell you the hardware version, the software version and will feature two buttons: Upgrade and Exit. Pressing upgrade will open a file selection window and allow you to select the new firmware file. Once selected, click the upgrade button again to upgrade the device. it is possible to downgrade if problems are encountered. Selecting exit, shuts the program down. Do not stop in the middle of the process. I did while writing this and bricked my device. I was able to run the program and install the firmware again to get it back up and running. I have been able to vape while charging, but I do not see in the manual that passthrough is supported. I would not do it, and will not again. Interesting and functional but unobtrusive firing mechanism with a great locking switch. Fairly accurate TC, and TCR adjustment. Wismec/Joyetech/Eleaf have some real work to do on their 510 connectors. They are a bit too shallow for some atomizers. On this device, if the atomizer is not sitting flush, the atomizer rocks a bit. The adjustment buttons, while clicky, are small, rounded, and easy to miss (black buttons on black background on my white unit). The MicroUSB port is STILL on the bottom of the device. Form: 9/10 - This device looks good and feels good. I can find nothing about the mods appearance that I don't like. Further, the hidden firing switch and physical lock is a very ice feature. I dinged that half a point because the MicroUSB port is still on the bottom. Although it's not a visual thing (I like the way they look), I am not a fan of the small, rounded, easy to miss adjustment buttons. Finish: 9/10 - A fully functional, but still wonky 510 connector is really the only thing I find wrong with the finish. I only knock a point off because, wonky or no, it is still quite usable. it's even very good with the right atomizer. Function: 10/10 - I've run it in every mode, and it has performed as advertised. Zero complaints about its functionality. Final: 9.3/10 - A very reasonably priced, accurate box mod with oodles of options, in a package that looks good. But, Shawn, what about the Crius? 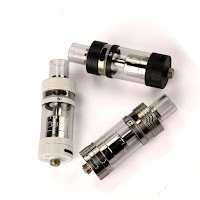 This is an RTA (rebuildable tank atomizer) that has been on the market a while. Funny, ain't it, that "a while," in the current state of things, is about five months? I watched reviews of this tank when it first came out in December of 2015. In fact, I got one in January of 2016. But it was brought back to top of mind when I accidentally dropped my iPV5 (sturdy device, by the way) with the Crius on top. The mod survived, the tank did not. 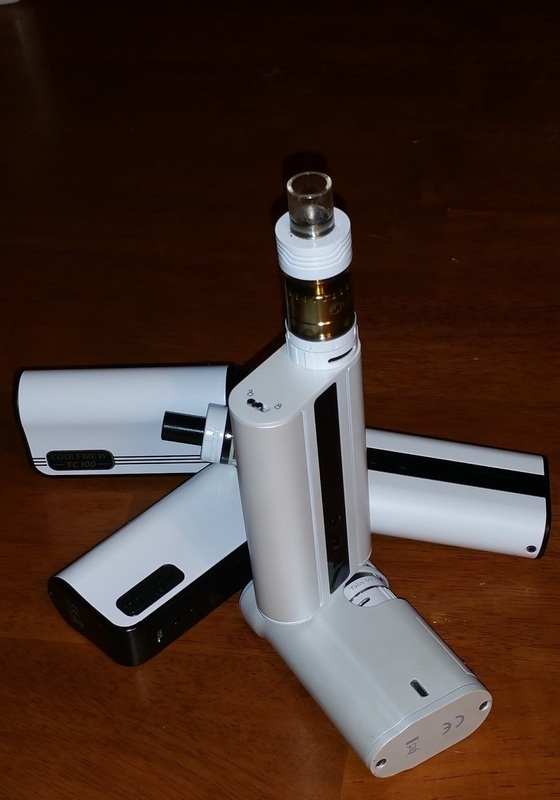 I debated not replacing it, but when I saw the white Crius pop up in a search right after I bought the white iStick TC100W, I knew I had to go all matchy mathcy and get it. The Crius is an amazing RTA. It was very innovative, and was one of the first - if not THE first - to feature the pop-up top fill now widely used by iJoy. It was also among the first to sport a velocity deck. Add in a now commonplace juice control, and it's nigh on a perfect RTA. The tank came with a sweet set of extras, too. A nice Pyrex glass drip tip with a stainless base (differentiating from the Goblin Mini which featured a simple friction fit glass tube as the drip tip), extra o-rings, a brilliant allen key screwdriver, extra grub screws, replacement glass section, cotton, and wire. As with the "review" of the 528 Customs Monster V3, I don't feel the need to give this device a grade, but there are some pros and cons. Overall, this is really very nice tank. It's not quite the same experience as the newer Griffin 22 with its relatively large deck, but that shortcoming is made up for with increased e-liquid capacity. It can be found for around $25 these days, and, in my not-so-humble opinion, is well worth the expense.